KUALA LUMPUR: Fancy taking a quick bicycle ride any time and anywhere in the city, with just a few swipes on your smartphone? With the oBike app, residents of the Klang Valley can rent a bike for any purpose, from a short trip to the LRT station or a leisurely weekend ride. In a city plagued by traffic problems, the idea for oBike has obviously been well received since its inception in April, as more than 200,000 users registered with the service can attest. OBike currently has 10,000 bicycles parked across the Klang Valley, including Sunway, SS2, SS15, Kota Damansara, Cyberjaya and Putrajaya, and even offers a personal accident insurance coverage of up to RM10,000 for each ride. At a rate of only RM1 for every 15 minutes, the oBike application tabulates the total cost for each ride by tracking the duration after a user indicates in the app that the trip has ended. It’s a simple enough concept, but the service is not without its teething problems, said frequent user Chong Tze Jia. “I usually take the bike from the train station at Sunway to my university nearby, it is a good in a way that it saves my time walking to the university. “However, there was one time when I ran out of data (on my phone), so I had problems ending my trip,” he told The Malaysian Insight. Because the company is giving a one-hour free ride throughout the month of September, Chong said, he didn’t have to pay for that trip. An experienced cyclist from Petaling Jaya, Syamsul Rizuan said he was pleasantly surprised to find that the bikes are well maintained, but said the app is not user-friendly. “They are around Petaling Jaya. I rode on it a few times just for fun at Damansara Utama during the weekends, as the bicycle frame is sturdy and light. “(But) it took me a while to understand some things like how to end the trip, or the credit penalty system on the app, so it is not user-friendly,” said the 43-year-old. But the company’s problems are more than just technical issues. 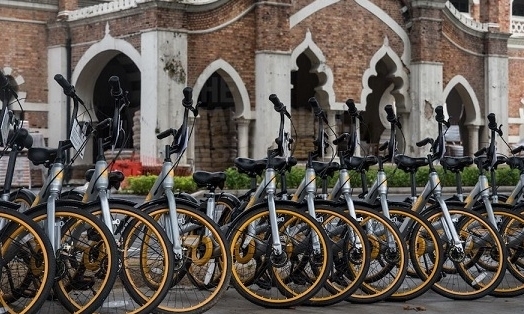 Apart from ironing out issues with the app, oBike’s promising start can be scuppered by run-ins with local councils and problems getting approval from Kuala Lumpur City Council (DBKL) and Petaling Jaya City Council (MBPJ). Business development manager Ian Goh said oBike approached the Selangor government in April and got an approval for its concept. However, the administration required a pilot project to be done at the Subang Jaya Municipal Council (MPSJ) to draft the bike-sharing service guidelines. “In Selangor, we have the pilot project in MPSJ SS15, but DBKL is different because it is under the federal government. “The Selangor government approved this concept, but they want the (full) regulation in place when the pilot project with MPSJ is over,” said Goh. As such, the bicycles are off-limits in PJ, he said, referring to a recent case of MBPJ issuing a fine of RM17,000 to oBike and confiscating more than 250 bicycles for obstruction in public places. Goh said that DBKL recently said it is keeping its options open on oBike’s services after partnering with the firm during the recent Sea Games. The council has also given them a permit to operate in Kuala Lumpur until the end of the month. Goh said DBKL and MBPJ’s main concern was that users would end up parking their bikes in a manner that would obstruct traffic and pedestrian flow, or even block tactiles for the blind. “We have about 20 people on patrol in KL to make sure the bikes are back in the relevant hot spots,” Goh said. The service also uses a credit penalty system, where oBike users can report other bicycles parked indiscriminately on the streets. Repeat offenders will have their oBike accounts suspended. “Everyone starts with 100 credit points, users can report other users. The lower the credit points, the higher the (charges) are. “For the user to get less than 60 points, they have already been warned multiple times and they will get suspended from oBike,” said Goh. He said the company wanted to build a community of responsible riders, adding that other issues, such as vandalism to their bicycles, were teething problems which can be overcome over time with education.